Please keep it general so all can be included not about subjects that can aggravate like Politics or Religion. Many thanks to RnR and Toot for making this into such an interesting topic on past events for us all to learn so much. Viv, will start off with this topic, as it would be dear to Gerry's heart. His interest in all Wildlife was well known to us and many Wildlife Carers throughout Australia. In the past 50 years there have been few acceptable records of Night Parrots. These records have been in western Queensland, north-eastern SA and inland WA, though its range could potentially also include other arid parts of Australia. Night Parrots usually inhabit arid or semi-arid grasslands that are dominated by spinifex, though they have also been recorded in shrublands dominated by samphire, bluebush and saltbush. Beautiful photo Sandi. Do they nest on the ground? Thanks for starting new chat thread Viv. I think it's great that it is in Gerry's, Geomac's (Geoff) and Seth's memories because they were all such lovely people and fun to chat with. Robi, They live on the ground. If you go to the ABC site you can hear a recording of their call. Dummy here, I don't know how to put it on the site. Thanks Sandi, Gerry would have loved it - I saw another article on them recently but cannot recall where. • Night parrot's drinking habits revealed in research expected to help habitat management. 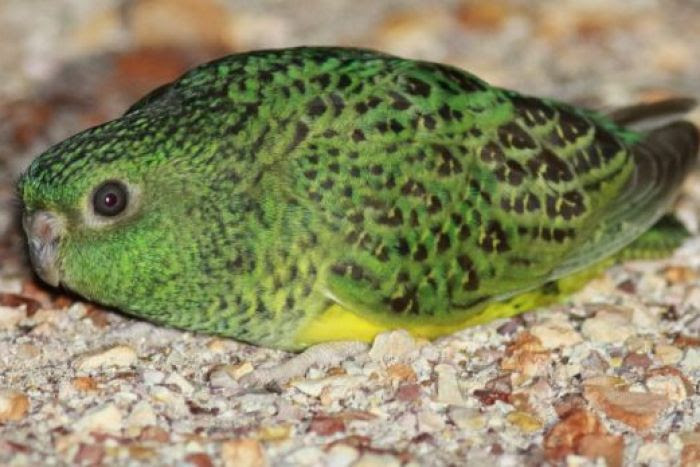 • Largest-known night parrot population found in Queensland. I do so hope it survives. Still coming to terms re Gerry and Geoff. Hasn't been easy has it. Thanks Sandi., the pics. of the wildlife topics which you sent, are wonderful. SO nice to chat but whatever room, I am happy. Think they have fixed it Phyl. All these names disappeared off my screen when I was reading the posts. Ray, Innes, Hiker, Barak. not sure who else. Have to work it out from reading the posts. Knew you would like those sites Phyl. It gives an insight into how much Gerry was doing. The Mundine thread was removed too. Also Barak's latest thread on Trump. I was trying to post a comment on it but it wouldn't go. Was Mussitate banned too? I just found my own answer - yes he was. That's nearly all the men gone in one fell swoop.Yes I realised after I posted that Mussi was gone too Robi. The whole thing just disappeared. I thought my computer had gone for a few seconds. Today's poster disappearances are extensive for me too, e.g. Ray, Innes, Hiker, Barak. Meanwhile, the latest US president scares me for various reasons ... not least our previous strong relations with the US ... now out the window if various press reports are anything to go by. Robi ... I tried to post the following to Barak's latest thread on Trump, but like you no go. • the ongoing press releases re the call, its content and a 'hang up'? Dangerous times for us I reckon. Hope not but the whole situation with Mr T is so unpredictable. Yep I have the same concerns RnR. It's a shame that thread went because it would have been good. I think not everyone would agree with me but I feel very sad that Mussitate, Shetso and Barak are gone and I just need to say that. Personally I liked and respected their honesty and intelligence. So nice of you to continue topics in memory of those who have passed. 1901 ~ Queen Victoria's funeral takes place in St. George's Chapel. 1653 ~ New Amsterdam becomes a city (later renamed New York). and, it’s Groundhog Day (United States and Canada). You have a very inquiring mind RnR. Love your pics. and stories. The above info. is good reading - thank you. Always wondered what a Groundhog was and why they had a holiday for it. Groundhog Day is a traditional holiday originating in the United States that is celebrated on February 2. 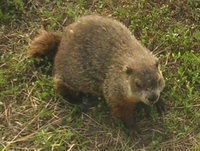 According to folklore, if it is cloudy when a groundhog emerges from its burrow on this day, then the spring season will arrive early, some time before the vernal equinox; if it is sunny, the groundhog will supposedly see its shadow and retreat back into its den, and winter weather will persist for six more weeks. Thanks Phyl and Sandi thank you for the pic and info. I'd never actually seen a groundhog before. :( What I want to know is which of our loveable Aussie wildlife creatures is responsible for this!! Prognosticators!! 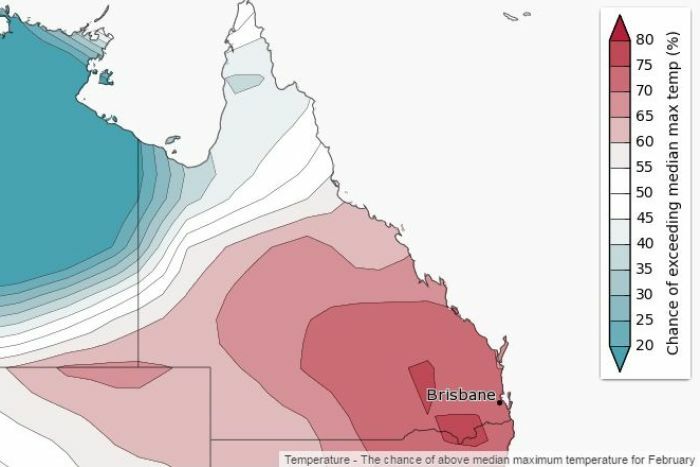 Temperature records will be shattered in February for southern Queensland, the Bureau of Meteorology has said. My bet is the little black ants, they’ve deserted my place for the first time in 10 years. Interesting Sandi and RnR. How did those little critters get connected to the saying "Groundhogs Day" which means going around and around in the same circle? Do you think we could have a holiday in their honour RnR ?? Animals always have an instinct over things. Dogs always know when there's going to be thunder and lightening long before we humans do and birds disappear as well. I think they are better predictors than our present day weathermen. From the movie I think Robi. Based on the creative idea ... an arrogant Pittsburgh TV weatherman who, during an assignment covering the annual Groundhog Day event in Punxsutawney, Pennsylvania, finds himself in a time loop, repeating the same day again and again. A great concept IMO and I always equate Groundhog Day with repetition, rather than its traditional associations. Thanks RnR, I really enjoyed that movie but never knew that the saying originated with it. Always thought the saying came first. Not many movies create a whole new saying in such popular use, in fact I can't think of any. :) Sandi. I would like to declare February 2 "Aussie Ant Day" in honour of those gone by (this topic), meteorological predictive excellence extraordinaire, strategic invasion techniques that make Sun Tzu look like an amateur and plain bloody irritation techniques that put midges to shame. Groundhogs are also called woodchucks (Canada) and whistlepigs. North country white trash. Origin: alcoholics who planned to build their own homes but never got past the basement where they live out the rest of their lives. My aren't we learning a lot today.Apparently Canada celebrates as well. As long as they stay away for you. You can celebrate and have a day off every year. Unfortunately I can't do that as I have every day off - like Groundhogs every day the same. Funny, Sandi. I have seen 'Groundhog Day' also, and never knew about it - thanks for the info matey. Never even seen a pic. Has anyone ever heard of baking biscuits - no fat or sugar? 1 cup of raw oats, and 1 large banana beaten together and spoonfulls onto oven tray, into a hot oven for around 10 mins. Let us know how they turn out Phyl. I have a couple of bananas in the freezer to get rid of. Hmmm I'm sceptical too Phyl. Let us know how they turn out. I am amazed as the Bics. are quite eatable and oh SO good for us. I put a bit of marmalade on a couple for Peter and I and quite morish. I am going to make a second few, using raw oat muesli and a large ripe banana. Good to help lower cholesterol? btw I made them in the 'Air Fryer' SO easy. Bananas, eaten in moderation, will more likely help than harm your cholesterol levels. They provide a good source of dietary fiber, which can help reduce your low-density lipoprotein – LDL or “bad” cholesterol. The potassium in bananas can also help lower your blood pressure, which may, in turn, lower your cholesterol. Hmmm I'm still sceptical Phyl - "quite eatable" is not the same thing as "beautiful", "yummy", "delicious". Yes Robi, eatable just doesn't sound right. Maybe it was the marmalade that made it eatable and I don't like marmalade either. Ah, a fellow marmalade hater :). There aren't many of us around Sandi. There were 5 in our household who couldn't stand it. Jenny won't even eat fruit cake if there's peel in it. I either have to buy the fruit ingredients so there isn't any or sit there and pick the peel out. Ha ha, pretty much the same in our family Sandy. No-one eats marmalade and no-one eats fruit cake. I will make Muesli ones tonight. How come they didn't just crumble apart? Was it a very ripe squashy Banana Phyl? That's a good question Viv. What held it together? Toasted multigrain bread and marmalade is breakfast for me. Plus a big mug of tea of course. A bit of a look around afterwards is part of the deal. It is many a year since a fag and a good look around was it for breakfast. S.D. did you see I made these very easy biscuits in 'the Air Fryer'. You could do that. Isn't hot buttered toas,t or fresh bread, butter and Marmalade beautiful. So you replaced the fag with marmalade on toast Shaggy? Now was that easy peasy or agony? Phyl, you didn't tell us you made them in the air fryer. Were you trying to lead us astray? We would have cooked ours in the oven and suffered failure and not known why. Even tho we did suspect that nothing but a banana holding them together was never going to work! I did not make the Museli ones yet, because all my bananas are only slightly yellow, and really ripe ones would be much better and make a sweeter biscuit. I will give them a go tomorrow (cooked in the oven since Hubby is against buying an air fryer) and report back. If they work I will kiss your toes and forever hold my sceptical self in check. How long do you think I should cook them in the oven for? The Air Fryers are top of the list of the best things we have bought, and use most days. Well Robi. I will give special attention to my toes, so they are 'lovely for you to kiss tomorrow' lol. Deanna I would not lead you mates 'up the garden path other than to pick figs maybe, which are getting closer to ripe and ready to pick. Geez Phyl my eyes honed in on stalks - you mentioned Figs I saw some the other day $49.50 a kilo! Funny when we were kids California Syrup of Figs was a laxative and the only other figs around were hard dry ones. It wasn't until I was in my 60s that I ate a real fresh one.....and fell in love with them, a lifetime of fresh juicy fig enjoyment missed and regretted. Yes Deanna, I think I agree with you. I can see an oven tray with a squishy mush on it. By the way Phyl, I also hate with a passion ripe bananas.Have to be firm for me to eat. We have a daughter visiting for a week or so in the near future. She has offered to take on the family photo collection, much neglected, lurking in boxes in various cupboards about the house. To this end we dug all the boxes out and and started to go through years of slides and photos. Talk about a trip down memory lane. Long forgotten places and situations. What a handsome devil I was all those years ago, something obviously went awry with the advancement of the years. Gone from a willowy youth to something resembling a red gum stump. Wendy is still a good looking sheila, must be the Pommy background. I don't know how old you are Shaggy but I do know you are in your later years and it's nice when a guy says his wife/partner is still "a good looking sheila". I think my guy is still pretty cute too. We met each other when I was 16 and he was 17. I too feel overwhelmed with the state our photos are in but the kids seem disinclined to have anything to do with them so you are lucky your daughter is interested in helping out. We were there every step of the way with Gerry, and it hit us so very hard, even though we knew he did not have long. I think Geoff and Seth were lucky dying suddenly without knowing death was coming. That is the way I would like it to happen for me. Gerry did the oh so hard yards, fighting for life and losing. But he left a golden feeling of himself that touched us while he shared his journey and that will stay with us. We were all getting lovely messages from Gerry two days before he left us.